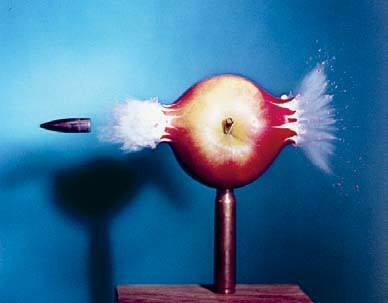 Harold Edgerton captured the interface between art and science, as in his photograph of a bullet passing through an apple. 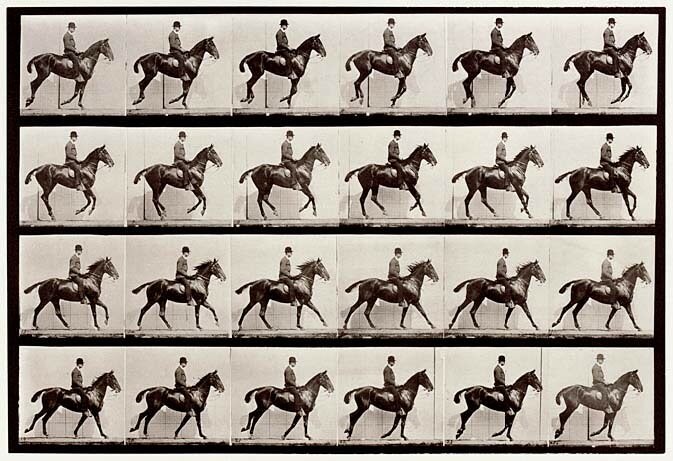 The image, by Eadweard Muybridge, explores the mechanics behind how exactly a horse moves its legs while running. Science and art collide in photographs by Harold “Doc” Edgerton, on display this fall in an exhibit at the Bruce Museum  in Greenwich, Connecticut. In the 1930s, Edgerton, an MIT professor of electrical engineering, developed technology that used strobe lights to capture images of moving objects, like the blades of a fan and a bullet striking an apple. The Bruce exhibition, “Science in Motion” (through October 16), features images taken by Edgerton and two artists: Eadweard Muybridge, who used stop-motion photography to create a sort of early “motion picture” for Leland Stanford (founder of Stanford University) in the 1870s, and Berenice Abbott, a photography editor for Science Illustrated. 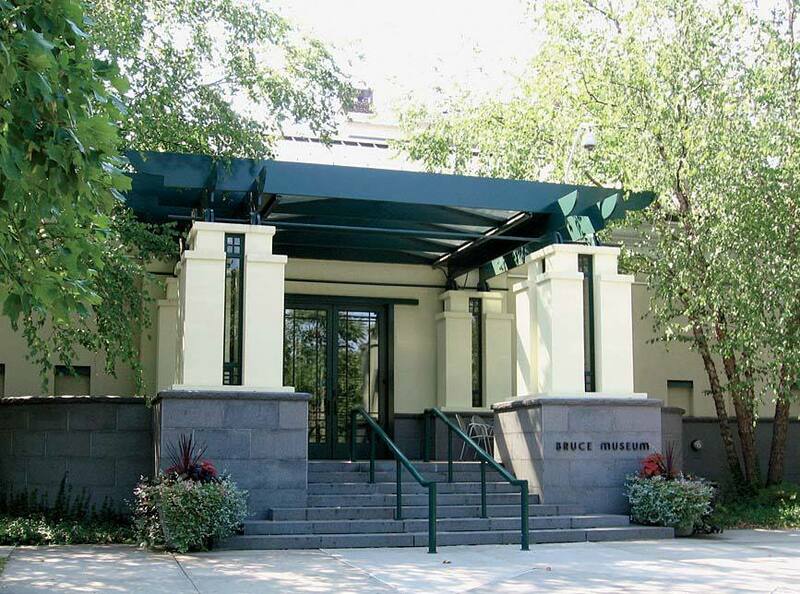 The Bruce opened in 1912, in what was once the mansion of merchant Robert Bruce, with a unique mission: to serve as an all-in-one natural-history, historical, and art museum. Its exhibitions and intellectual scope have grown considerably under executive director Peter C. Sutton ’72, a scholar of Dutch and Flemish art who directed the Wadsworth Atheneum Museum of Art, in Hartford, before joining the Bruce in 2001. The Greenwich museum’s permanent collection consists primarily of natural-history dioramas, but its galleries have recently featured paintings and drawings by the likes of Edgar Degas and Mary Cassatt. Also on display this fall are exquisite pen-and-ink illustrations in “Flora and Fauna: Drawings by Francesca Anderson” (through October 30), and a kid-friendly, interactive exhibit on electricity developed by the Franklin Institute in Philadelphia (through November 6). 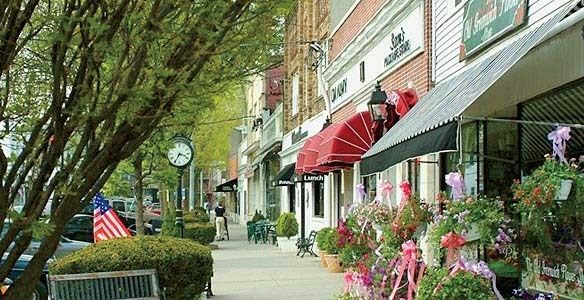 The museum is a five-minute walk from the Greenwich Metro-North station and the town center, where shops range from local boutiques to Brooks Brothers and Hermès. Grab lunch at Meli Melo, a crêperie and juice bar, or stop at the Elm Street Oyster House for some of its celebrated seafood. Or, if the weather permits, enjoy a picnic just down the street from the Bruce Museum at Roger Sherman Baldwin Park, which has views of Greenwich Harbor and the Long Island Sound. The park also hosts special events throughout the year, from the Greenwich Wine and Food Festival, featuring celebrity chefs and gourmet meals (September 23-24), to the Puttin’ on the Dog fundraiser for Adopt-A-Dog (September 18), which includes canine competitions like “best tail wagger,” along with music and food for the human attendees.